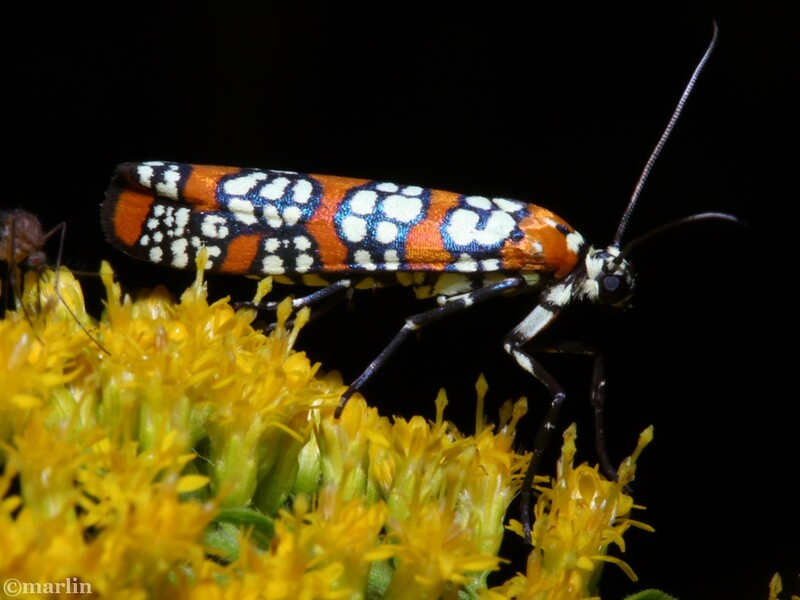 Ailanthus webworm moth is the lone representative of this genus in North America. This very common moth ranges from Ontario and New York south to Florida, west to Nebraska and Texas, and south into Mexico. Gregarious larvae are found in communal webs on their host plant, Ailanthus, aka tree of heaven, stinking sumac, or varnish tree. Ailanthus, often planted as a fast-growing ornamental, this Asian native has become invasive in North America. This hardy native moth has quickly adapted and expanded its range and numbers along with the inexorable march of the tree. I don’t often see them here in Northern Illinois, but when I do, they are always taking nectar at flowers. Shown here on sedum and field goldenrod. 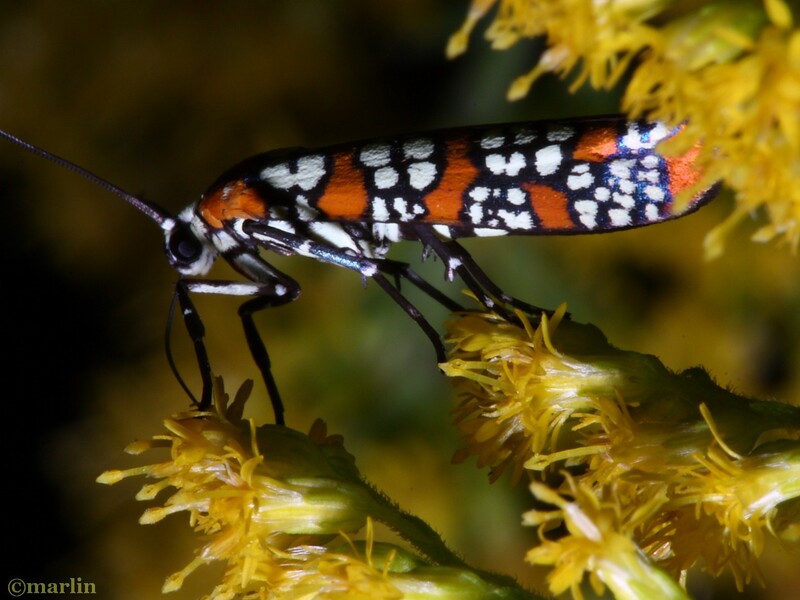 I like to get up close to my bugs, using a hand held flash. The blue iridescence you see in the scales bordering the white spots are barely visible in daylight, but the flash reveals hidden details at higher magnification. Always use the smallest “sweet spot” aperture you can, and shoot at the slowest shutter speed possible without getting motion blur. (It’s easy to mistake blur for out-of-focus.) The sweet spot aperture on my Canon 100mm macro lens is f16, so I shoot at 1/60 if possible to avoid the pitch black background. That’s where the flash really helps “freeze” the scene. Of course, if it’s windy or the bug is moving rapidly, you’ll have to increase your shutter speed accordingly. 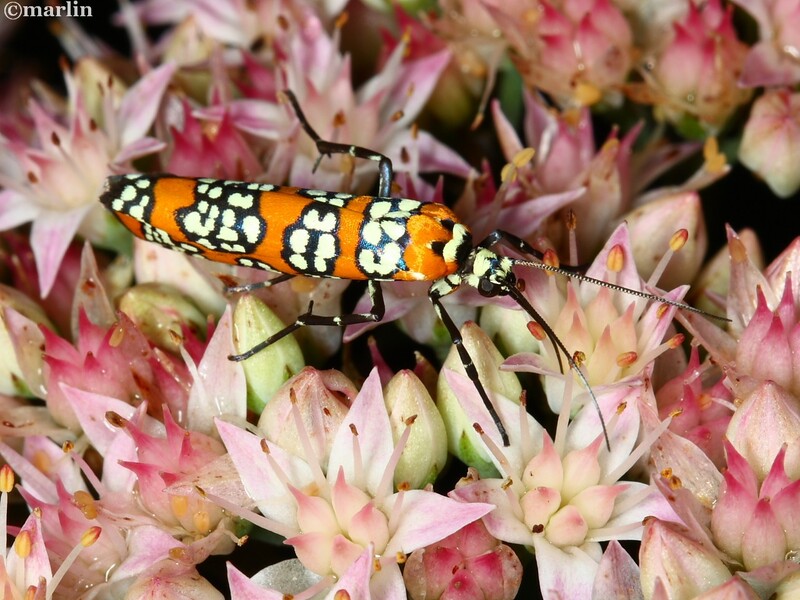 The striking orange markings are thought to be aposematic, that is, warning colors advertising toxicity or weaponry. Predators know to avoid certain prey who exhibit these colors, e.g., the viceroy & monarch butterflies share orange aposematic coloring with a wide variety of insects that obtain their chemical defenses from feeding on milkweed; yellowjacket wasps and the flies that mimic them the all share bold yellow and black aposematic paint jobs. 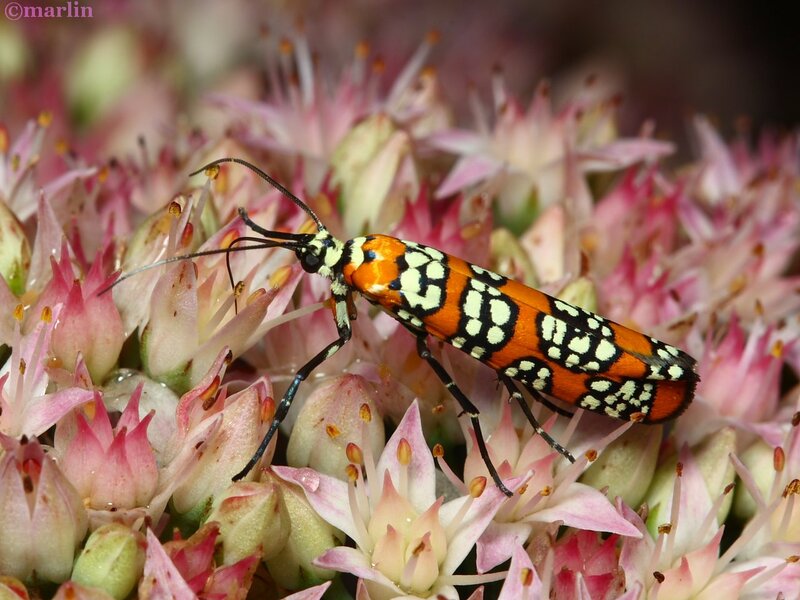 Tree Encyclopedia / North American Insects & Spiders is dedicated to providing educational resources for our users through large macro photographs of flora and fauna in their natural habitat.